Looking to upgrade or purchase your first angle grinder? We will walk you through the steps of choosing an angle grinder and list the criteria for which you need to base your decision. The main section of this entry will take you through our list of top ten grinders, their variations in specs, power, and rotations per minute, safety features, and other factors. Angle grinders can be put to different uses. A few of these applications range from the installation of walls, cutting through tiles, and concrete. Angle grinders also offer accuracy and convenience, hence contractors prefer to use them. With the proliferation of angle grinders in the market, choosing the most appropriate one for your tasks can be quite daunting. The number 1 grinder today, according to us, is the one from Porter-Cable, the PC60TPAG. It is quite superior at removing material considering that it operates on 7-amp delivering speeds of up to 11,000 rotations per minute. Such immense power not only makes your work more convenient but also eases it. 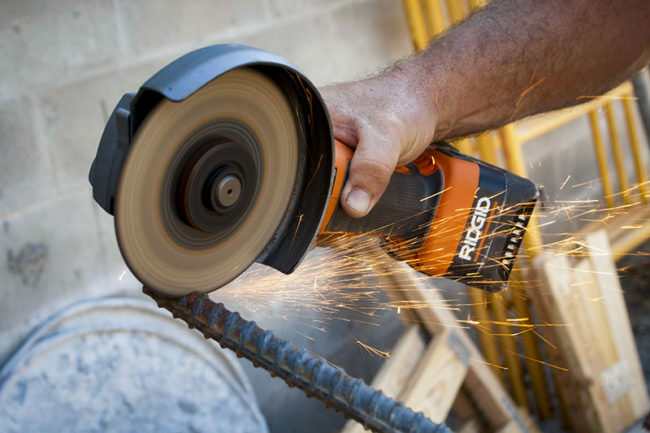 This corded angle grinder, operating at 120 volts, has enough power to effortlessly cut through a disc type padlock. The solid construction of the tool is also commensurate with its power and performance. The angle grinder uses a gear made of cast metal as the outer casing, which makes it quite appropriate for both domestic and industrial applications. The durability of the cast metal gear means the angle grinder will still be usable in various environments irrespective of their conditions. Therefore, you have tool longevity assurance not easy to find in other grinders within this price range. To ensure an ease of use, the angle grinder does not require the use of any tools or special mechanisms to adjust the guard. Consequently, the tool-free guard change and removal system protect you from any potential injuries or harm. Additionally, you will be able to adjust the handle on the side to three different positions, in accordance with your needs. The angle grinder furthermore has a weight of just 4.1 pounds, meaning that it is portable and manoeuvrable. The grinder blade has a measurement is 4 1/2". The Porter-Cable PC60TPAG is capable of a wide array of functions. Other than welding, fabrication, and contractor projects, the angle grinder can similarly be used to polish, cut metal, and grind. Additionally, the lock requires the use of just a 1 wrench to change bits. The PC60TPAG 7-Amp Angle Grinder Tool features a non-lock mechanism on the switch aimed at increasing safety and controllability. The delivery package includes the angle grinder itself, the cut-off wheel, a grinder wheel, the wrench and lastly a side handle. Other accessories that come with the package are a cutting and grinding guard, and a user manual. The angle grinder has a limited warranty of 3 years and a twelve-month contract for free servicing or parts replacement. In all, this tool is the best angle grinder at its price range. It combines several key features and delivers indisputable and steadfast power and speed. Unlike other angle grinders, it does not compromise on power, speed or efficiency. It is appropriate for polishing, smoothing, and cutting purposes. It is worth noting though that even though the Porter-Cable PC60TPAG 7-Amp Angle Grinder Tool is specifically meant for domestic purposes, you can occasionally use it for less-demanding industrial applications. 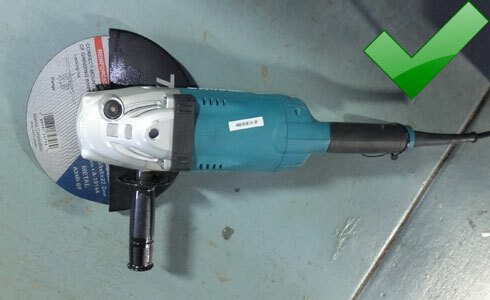 The entry of the Makita model 9557PBX1 in the angle grinder market has significantly shifted the paradigm. The grinder is undeniably one of top angle grinders out there. It is clearly for people who are intuitive and are keen on performance. The grinder has a conspicuously small barrel grip that measures just 2 and 1/2" in circumference so that it fits with ease into your hands. It has a choice of two power sources, Alternative Current and Direct Current. You can switch between these two with relative ease. To make the angle grinder more flexible, portable and comfortable, it has an XL design. The 9557PBX1 is considerably light, weighing only 4.5 pounds. Additionally, it has very powerful motors. The durability of the grinder is also an assurance with the inclusion of the varnish zig-zag seals. The zig-zag seals aim at protecting the armature from the destructive nature of debris. The inclusion of a paddle switch aims at providing maximum protection to the bearings and covering the motor from being contaminated. The angle grinder also comes with the useful and lock-off feature whose aim is to protect the user from any injuries while working. 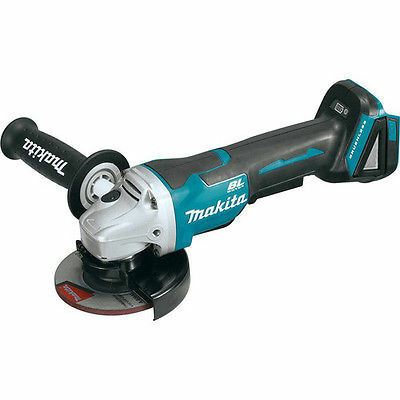 For additional performance and convenience, the Makita 9557PBX1 4-1/2-Inch Angle Grinder has a wheel diameter of 4 1/2 " and measures also 11 and 3/4 in total length. The thread of the spindle, on the other hand, has an UNC of between 5/8 and 11. The above-mentioned 7.5 amps of power is capable of achieving speeds of between 2,800 and 10,500 rotations per minute. Such speeds are more than enough to enable you successfully complete any domestic or light industrial project. The angle grinder is even more flexible as its gear housing feature 90-degree rotational capability. Unlike a majority of angle grinders within this price range, it has an electronic limiter. Its function is to prevent the motor from overloading, thereby preventing the possibility of any burnout. Notable features are the inclusion of a tools-free mechanism for adjusting and changing the guards and the shaft lock. A side handle gives you additional control over the angle grinder, so it does not wander about. A wrench (lock nut) makes it relatively smooth and effortless to change different parts of the angle grinder. 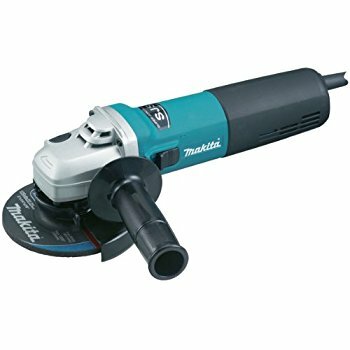 Furthermore, the angle grinder has a Makita spindle lock to make the process of changing wheels a comfortable and smooth experience. Included in the delivery package are the wheel guard, flange, side handle, wrench, as well as the grinding wheel. To top it off, the angle grinder comes with a twelve-month warranty. Falling under the budget category, the Porter-Cable PC60TAG 6.0-Amp 4-1/2-Inch does not compromise on performance and power. The mechanism for changing the guard is tool-free. Consequently, you can easily change the guard within a few seconds conveniently and much faster. The PC60TAG has a powerful and long-lasting 6.0-amp motor. You can, therefore, use the angle saw for a variety of projects and subject it to different conditions. Because of its 6.0 amp motor, the angle saw is capable of delivering high speeds of up to 11,000 rotations per minute. Changing the bits of the angle saw with just a single wrench is relatively easy given that it has a spindle lock. A very significant feature of the Porter-Cable grinder is the guard removal tool. With the tool, you can substantially increase your precision as it ensures there is an alignment between the guard and the spark path. For additional convenience, you will be able to switch the side handle between three different positions. The design of the angle saw affords you the freedom of moving and rotating the handle depending on the demands of your operation. The handle is furthermore ergonomically designed to increase safety and comfort while grinding. Ideally, the angle saw can be used for a variety of purposes. You can use it to cut metal, tuck-point, give surfaces a final finish, grind metal, and lastly to clean surfaces. Both the flange and the bolt are capable of accommodating discs measuring 7/8 inches. The grinder is also quite a durable tool considering that it has a cast metal gear case that does a wonderful job protecting the motor and the gears. The same wrench you use to change the guard can also be used to change the discs in accordance with the operation you are undertaking. In spite of its metal components, it weighs an incredible 5 pounds. Besides, it has a coat of gray finish that helps preserve its vital components thus ensuring longevity. The angle grinder comes with a warranty of 3 years besides a 12-month contract for free servicing. Some of the professionals who will find it to be a useful tool are electricians, plumbers, contractors, and other closely-related occupations. On a negative note, however, the grinder does not accord you the ability to alter your cutting angle. If you have an eye for power, flexibility, and top-shelf performance, look no further than the Ingersoll model 3101G grinder. This angle grinder is air-powered and is appropriate for the environmentally-conscious users. The self lock of the throttle on the lever comes in handy in stopping the angle grinder from accidentally starting up. 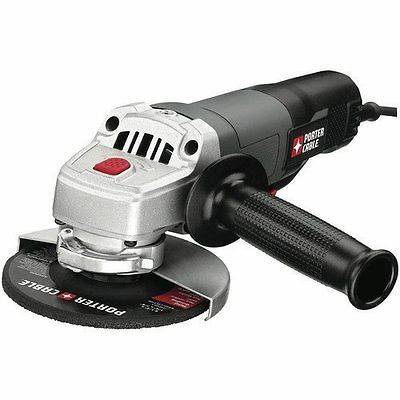 Additionally, the inclusion of a exhaust on the back makes this angle grinder one of the most efficient angle grinders within this price range. The ergonomic construction of the grip of the 3101G makes it comfortable to operate. Handling is especially more efficient with the contoured design of the grip. Because of its ball-bearing design, the grinder has noticeably less vibration and is better balanced. These measures considerably increase the durability of the angle grinder. 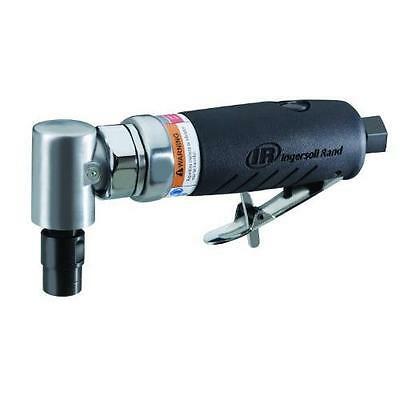 Coupled with the strong aluminium casing, you can use the Ingersoll Rand 3101G Edge Air Grinder in any environment, whether it is the conducive indoors or the tough outdoor environment. The 3101G delivers impressive speeds of 20,000 rotations per minute. With such immense speeds, it has quite ample grinding and cutting abilities. You will be finishing your projects smoothly and with accurate precision. The angle grinder delivers a perfect balance of power and speed. Other than being quite speedy for an angle grinder of its weight and size, it also does not compromise on power and performance. Unlike most of the angle grinders in the market, the Ingersoll Rand 3101G grinder has an air inlet measuring approximately 0.25 inches NPT. Additionally, it is portable and light and can, consequently, be used in places such as cabinets. Those keen on preserving the environment need to note that its rate of air consumption stands at 3 and 18 CFM when running. With the collet measuring approximately 1/4 inches, the grinder has an approximate weight of just 1.3 pounds. This makes it one of the lightest angle grinders in the market currently. You are therefore sure of portability and flexibility, not to mention efficiency. Overall, while the grinder has a very light weight, it is considered big in terms of performance, construction, and handling. All the key additional features of the angle grinder should rightly give you the impression that your security and safety are guaranteed when working with the Ingersoll 3101G. For all your general-purpose grinding needs, this angle grinder should be your first and last resort. While it is economically and durably built, it does not compromise on speed, performance or power. 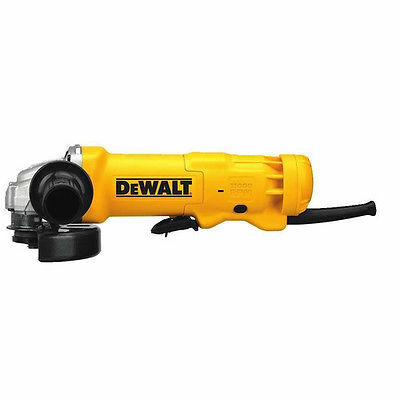 The Dewalt brand has worked very hard over the years to gain the trust of the public, and this clearly demonstrated by the DeWalt DWE402 grinder. This angle grinder comes with an astounding 11-amps motor. Subsequently, the angle grinder effortlessly reaches its maximum speed of 11,000 rotations per minute. The amount of power this angle grinder provides is sufficient to complete any domestic projects or light industrial applications you may have. You can switch between powering the motor with either Alternative Current or Direct Current. It features a dust ejection feature that efficiently removes dust particles and debris from its delicate moving parts. Other than prolonging the shelf life of your angle grinder, the ejection system will also leave your work station clean and free of debris. You are thus guaranteed of a well-organized, safe and conducive work environment. Running at a horsepower of 1.8, the DWE402 has blades measuring approximately 4 1/2". Changing wheels on the grinder is relatively stress-free. The grinder has a one touch feature allowing you to rotate the tool a full 360-degrees without necessarily having to change your grinding position in response. Changing from one wheel to another does not require the use of any additional tools or special keys. The angle grinder has a Fast Change Wheel Release system. This feature significantly shortens the time and effort it takes to change parts and also increases the durability of the angel grinder. To prevent the possibilities of accidental start-ups, the grinder comes with safety lock-off for the paddle switch. This guarantees that at no single time will you suffer accidental injuries. The safety lock-off feature on the angle grinder plays the significant role of saving battery power and preventing accidental damages to the angle grinder resulting from accidental start-ups. You can deliberately increase the depth of your cut with the use of the button to spindle lock. Hence, you will not be compromising on durability and performance. The ergonomic design of the handle, together with its extra-large threading, makes the angle grinder more comfortable to handle and operate. The ergonomic design of the handle entirely eliminates the possibilities of the angle grinder slipping from your hands as it guarantees a solid fit. The angle grinder has a weight of just 6.2 pounds and has a yellow colour finish. The grinder has a three-year limited warranty. Going by its name alone, you get the idea that the DeWalt D28115 grinder with trigger grip is a premier power tool. The solid construction aims at preventing dust and other debris from entering the air intake vents. The delicate internal components of this angle grinder will therefore always be clean and clog-free. The angle grinder is not only corded, but it also comes with a superior motor in a 4 1/2-inch design that significantly improves performance. The 13-amps motor does a tremendous job in efficiently avoiding instances of overload and also delivering an impressive 9,000 rotations per minute of power. You can use the speed adjustable feature to keep the speeds within a comfortable range. This makes the angle grinder a smooth and efficient cutter and grinder. Additional functions that make the grinder a true champion are the trigger grip and dual abrasion protection. These features assist in protecting the angle grinder’s motor from the destructive repercussions of dust and debris. To top it all off, the tool comes with a quick-change wheel release that eliminates the need for extra instruments and keys. Consequently, you will be changing your wheels relatively effortlessly with the tool-free removal mechanism. Furthermore, the D28115 has a side handle that substantially reduces the severity of resultant vibrations. With the vibration-reducing feature, you are sure operating the angle grinder will be much easier and comfortable and more forgiving on the hands and joints. Furthermore, since it has a dual handle, your cutting and grinding will be done with near-perfect precision and without shaking. The angle grinder has an ergonomic design and a grip barrel that increases comfort, especially when working on demanding and prolonged projects. 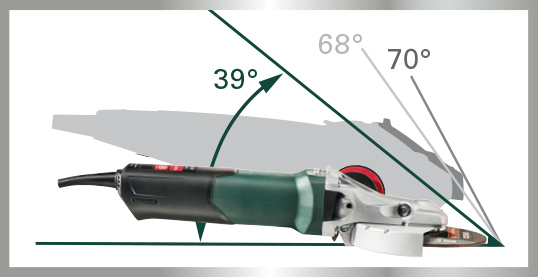 This angle grinder measures 4 1/2 –inches in length. In all, the package comes with three years of limited warranty, and the company offers 12 months of free services from the day of purchase. This angle grinder will provide you with so much power and performance in a way you have never experienced before. By taking advantage of the quick-change wheel release system, changing the wheels will take a couple of seconds. The dust ejection system eliminates the need to manually get rid of dust after it accumulates to inconveniencing levels. The system significantly prolongs the shelf life of the angle grinder, giving you years of reliable and robust performance. Also, the angle grinder has an adjustable key guard measuring five inches. Pair that with the automatic turning-off that kicks in whenever the angle grinder is overloaded to avoid damage, and you have the best angle grinder on the market. The most important feature that sets the Makita 9565CV apart is the Super Joint System, commonly referred to as the SJS. This feature offers maximum protection to the gear against the damaging effects of dust and grinding debris. On several occasions, while cutting or grinding through whatever material, there is a high probability that your angle grinder will get stuck. It is an inevitable and unavoidable possibility. In such occasions, your angle grinder may suddenly stop working. This is where the Super Joint System comes in handy. The SJS protects the gear from chipping, thereby giving your angle grinder more shelf life. There is less likelihood of finding yourself in a situation where the angle grinder gets stuck and instantly stops working. Over time, however, after several such sudden stops, the gears will drastically fade out and fail to transmit power from the motor. Such is the beauty of the Super Joint System. The Makita 9565CV has one of the most powerful motors in its price range. This is near twice the power supplied by most angle grinders and is more than sufficient for all domestic projects as well as a few and occasional industrial applications. With this immense power, the Makita 9565CV effortlessly and smoothly takes on one of the biggest diamonds rims in the market measuring at least 5-inches. Grinding through denser pieces of metal has never been easier and more fun. Furthermore, the Makita 9565CV has sufficiently large carbon brushes that are guaranteed to last for the foreseeable future irrespective of the grinding conditions you put the tool through. The 12-amps motor comes with a variable rotations per minute capable of achieving speeds of between 2,800 and 10,500 rotations per minute. This is more than sufficient for your everyday projects. With its Labyrinth construction, the angle grinder is quite easy to handle and operate. Since it is light, compact, and ergonomic, it naturally fits on your wrist. It responds surprisingly well to changes in grinding workload. Additionally, the Labyrinth construction dutifully prevents the entry of dust and other grinding debris from getting into the delicate parts of the Makita 9565CV. The 9565CV talks the talk and walks the walk. It comes with an electronic limiter that efficiently comes to life whenever the motor is overloaded. Subsequently, it promptly regulates the speed of the motor within a safe range thereby preventing overheating. On the same note, the electronic limiter also prevents the motor from suddenly and accidentally coming to a stop as this could have adverse repercussions. Consequences, you are sure you will be using your this angle grinder for the foreseeable future. To recap,it comes with the Super Joint System technology and is both light and ergonomic. The labyrinth construction makes it easy to operate, and it comes in 4 1/2 and 5-inches. With its 12-amps motor and accompanying variable rotations per minute, this angle grinder can comfortably achieve speeds of between 2,800 and 10,500 RPM. 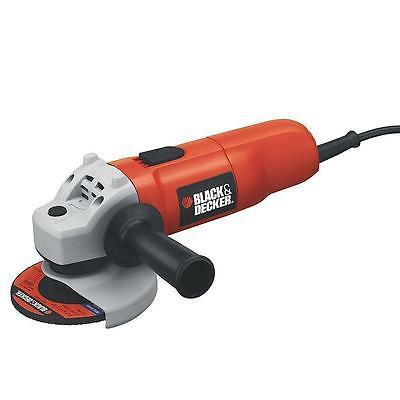 If you have a limited budget or just looking to buy an angle grinder maximized for everyday projects, look no further than the Black & Decker 7750 grinder. You can use it for a considerably wide range of light applications such as cutting, grinding, sharpening, among others. In spite of its low pricing and the fact that it is an entry-level angle grinder, this tool has enough power to grind over materials of different densities with a lot of ease. Even though it does not come close to other angle grinders regarding power, it nonetheless comes with a 5.5-amps of motor power that delivers adjustable speeds of 10,000 rotations per minute. Such impressive power and speed delivery for a budget angle grinder are almost surprising. Furthermore, perhaps contrary to your expectations, this angle grinder does not overheat or bog down with significant increases in load. With its 2-position side handle and the conveniently positioned slide switch, you have additional control and freedom to work at several positions. The addition of the constant-on option of the side handle actually makes the angle grinder a two-handed tool. Additionally, to make you more comfortable while working, the angle saw features a contoured body grip. The 7750 has a metal gear case that significantly increases the longevity and shelf life of the angle grinder. The spindle lock on the grinder measures between 5/8 - 11 inches. It does a tremendous job holding the wheel in position so you can quickly and conveniently change parts and bits of the angle grinder as you wish. The delivery package comes with a spanner wrench and a metal grinding wheel. The entire package has a two-year limited warranty for purposes of repair and parts replacement. Since this is a budget choice, we strongly recommend that you specifically use it on light domestic projects. Grinding through dense metals, paving stone or brick could adversely affect its future performance. As with all angle grinders, we can stress enough the importance of taking safety measures when working with angle grinders. In light of their fast spinning grinding wheel and the incredible torque force generated in the presence of resistance, you should always wear gloves, safety goggles, and possible body-covering clothing. As far as the world of angle grinders go, you are sure Milwaukee has your back. The Milwaukee 6130-33 comes with an Overload protection feature that protects it from accidental damage. This angle grinder comes with a usable 7.0-amp motor delivering 11,000 rotations per minute. Consequently, with these specs, you have more than enough power to accurately complete the projects you are undertaking. 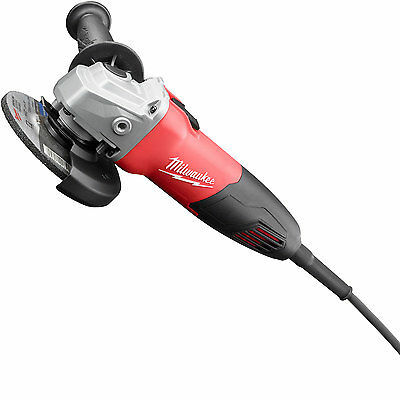 The suitability of the Milwaukee 6130-33 7-Amp 4 1/2-Inch Small Angle Grinder for domestic operation is further informed by the fact that its epoxy motor runs on 120 volts of alternative current. To reduce the vigorous vibrations that come with grinding through tough materials, this angle grinder comes with vibration-reducing capabilities. Couple this with its superior performance, you will definitely enjoy grinding through materials with the utmost ease. 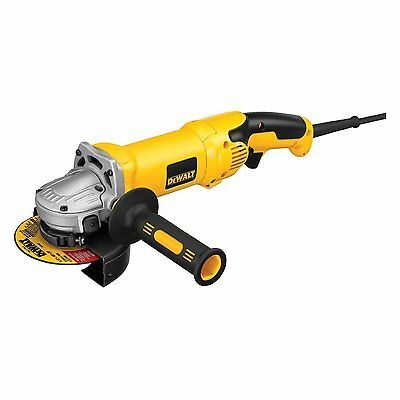 Since the Milwaukee 6130-33 7 Amp 4 1/2-Inch Small Angle Grinder packs a powerful motor and variable speeds of up to 11,000 rotations per minute, it is an appropriate tool for a wide array of operations. Moreover, its solid construction will ensure you continue using this tool for several years to come. The 6130-33 7 has several other attractive features. Its guard is reinforced with metal to prevent it from burning when subjected to heavy duty operations. Furthermore, changing the guard on the angle grinder is a tool-free endeavour that does not necessitate the use of special keys or screws. It also has an epoxy motor protection to prevent dust and other grinding debris from coming into contact with the motor. The cord, measuring approximately 8-inches, has a double insulation. The spindle thread works impressively by holding the wheel in position so you can quickly and conveniently change parts and bits of the angle grinder as you wish. 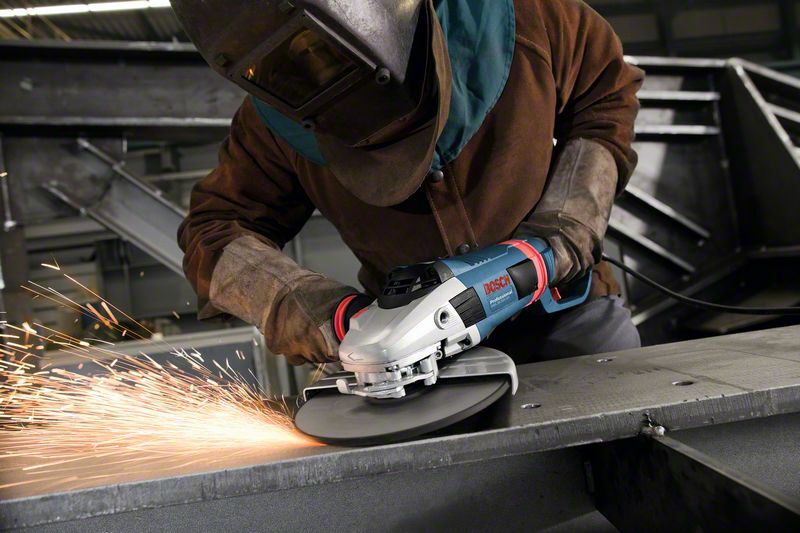 It terms of performance, power, and speed, there is just no limit to the things this angle grinder can do. It's 10 1/4-inches in length with a weight of just 3.5 pounds. It is as manoeuvrable as it is easy to control. The delivery package arrives with the angle grinder itself, a grinding wheel, a guard, as well as a spanner wrench. All these features have one objective, ensuring you have a smooth, productive and efficient operation. They are also meant to provide you with maximum protection and keep you safe from injuries. Contractors and artisans keen on protecting the environment should look no further than the 4 1/2 –incher Makita Model. This angle grinder is capable of attaining maximum speeds of 8,500 rotations per minute at 18-volts. While some may consider this to be average, the angle grinder offsets this by having a perfect balance between torque and rotations per minute. The inclusion of the Star Protection Compute Controls technology with the RPM feature protects the motor from accidental damage resulting from either an overload or instant slowing of the motor. The angle grinder packs a no brush motor, which, other than abolishing the need to use carbon brushes, gets rid of excess heat for prolonged use. With this feature, you will feel like your long-lasting LI-on battery is lasting forever, especially on light projects. 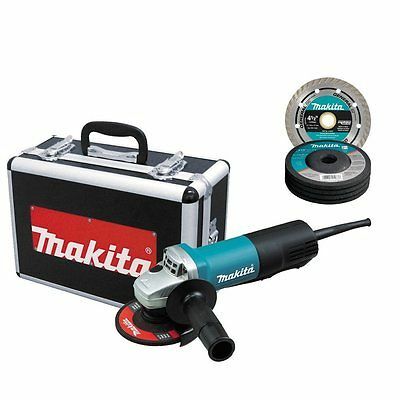 The Makita XAG06Z 18V Cut-Off Angle Grinder comes with an on and off lock mechanism thereby keeping the bearing and the motor from damage and contamination. Additionally, the feature gives you additional control, flexibility, and manoeuvrability. It has a soft-start option which is quite economical with the battery, making it discharge at a considerably slow rate. The switch on the paddle is also noticeably large to make it relatively easy to handle whenever needed. The ergonomic design of the XAG06Z together with its compact construction substantially reduces fatigue. With such power, performance, and comfort, we can assure you that you will be looking for every excuse to continue working on your projects. 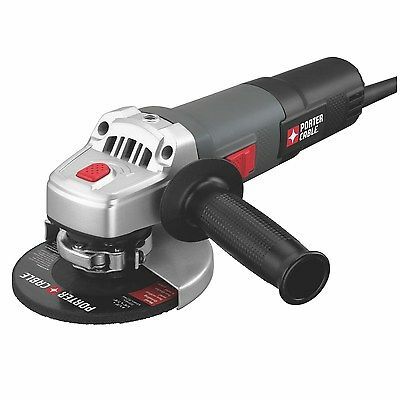 The immense power this angle grinder supplies makes it perfect for cutting, or grinding and grinding. You can use this grinder on a broad range of materials including conduit, pipes, and concrete, among others. Lastly, it comes with three years of warranty for free repairs. The price of most angle grinders falls within the bracket of $30 and $200. However, the price largely depends on the brand, features, and specs. The more the features and specs an angle grinder comes with, the higher is the price. In this regard, you need to pay attention to amperage, watts, rotations per minute, as well as other key features. A majority of angle grinders have speeds falling between 8,000 and 11,000 rotations per minute. There are a few whose speeds fall outside of this range. Angle grinders requiring or running at much higher power levels are generally more expensive. While some are corded, others run on lithium-ion batteries and a few others are air-powered. The performance of an angle grinder rests significantly on the size of the disks. The size and type of disk you settle on, need to be appropriate for the project you intend to carry out. Since angle grinders have incredible power and speeds, they tend to vibrate a lot. Vibrations have adverse consequences on the precision of cuts and grinds. To counter this, pay attention to the measures taken to increase convenience. These would include the inclusion of side handles, ergonomically designed grips, vibration-reducing bearings, the mechanism of changing wheels and guard among others. You need to make sure the angle grinder you pick out is safe enough for general use. Therefore, you need to consider whether it has systems for dust ejection, spindle locks, paddle switches, and protection against overloading. Other than keeping you safe from harm and injuries, these additional features can drastically increase the durability of your angle grinder. Q: What purpose do angle grinders serve? A: You can use an angle grinder on a broad range of applications in or around your workstation. You can use it to cut metal, tuck-point, give surfaces a final finish, grind metal, and lastly to clean surfaces. Also, because angle grinders have fast speeds of between 2,800 and 11,000 rotations per minute, angle grinders can be used to strip or deburr cement or dirt from a majority of metal and garden equipment. Some of the materials you can cut through or grind with an angle grinder are concrete, stone, and tiles. This tool can additionally be beneficial in fixing floor tiles and plumbing. Q: What measures can I take to ensure I properly use one? A: It is prudent that you ensure that your cutting material is properly secured with a clamp. Angle grinders are known to occasionally kick back if used incorrectly. To prevent this, ensure the grinder spins from the edge instead of into your cutting material. Additional measures come in the user’s manual, and we cannot stress enough the importance of following all the instructions to the letter. Q: What advantages does an angle grinder offer over other tools? A: Angle grinders can maintain relatively the same speeds for an extended period. Furthermore, their construction is done with the user in mind and in a way that ensures their safety. For instance, a majority of them systems that avoid overloading the motor and use bearings to reduce vibrations. Top shelf angle grinders have astounding efficiency and versatility. The decision on the best angle grinder to buy should be based, first and foremost, on the project you intend to accomplish. Nevertheless, you should never compromise on performance and durability. These two factors also have a significant bearing on safety. You should, therefore, treat this article as a guide to purchasing an angle grinder that suits your needs.